The Salter Brecknell LPS150 / LPS400 scales are particularly suited to shipping/warehouse applications and general purpose weighing. These are very affordable scales with accurate weights up to 400 lbs. The dual power modes (battery and AC adapter) enable portability or permanent installation (AC adapter not included). A large, simple to read display can be wall or stand mounted for easy visibility and the large keyboard switches work with gloved hands (wall and desk bracket included). The indicator cable is a coil style for durability and easy extension. The LPS Series features RS-232 interface that can transmit and receive using a demand type protocol. Scale comes standard with NCI protocol and interfaces to most common shipping software, including UPS™ Worldship Online and FedEx®. 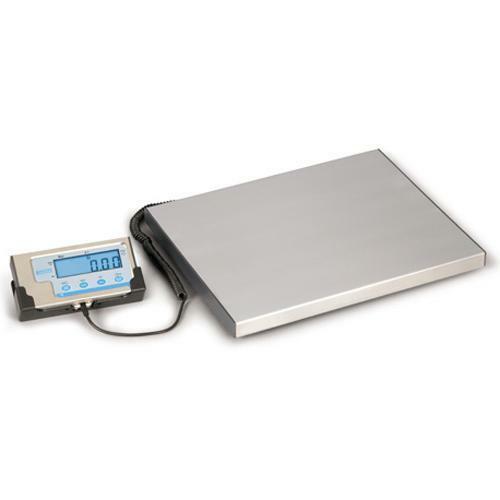 A durable low profile platform allows for easy weighing.